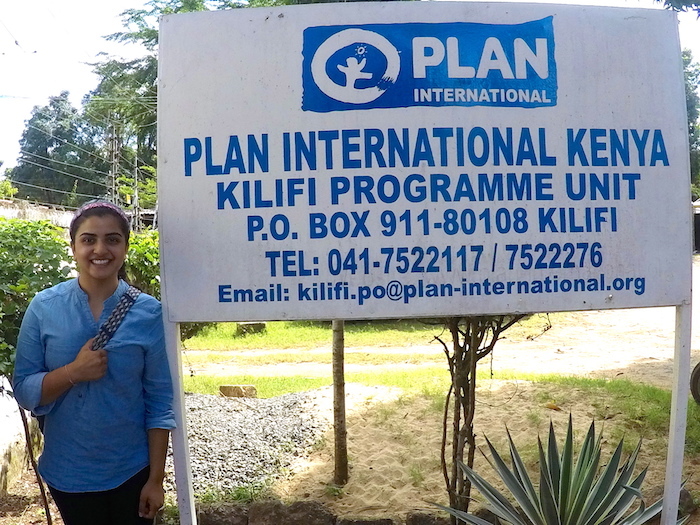 Nutrition science student Krupa Trivedi spent her summer in India and Kenya researching the importance of human donor milk banks and the relationship between health issues and female empowerment. We asked Trivedi about her summer research and the opportunities she has been afforded as a recipient of the Chancellor’s Leadership Scholarship. Can you tell us about the research you have been working on this summer? What are you hoping to accomplish or learn? I had the privilege to investigate multiple topics related to women and children’s health. In June, I traveled to Vadodara, India, to work at Kashiba Children’s Hospital. This pioneer institution is the second hospital in India to establish a human donor milk bank. The World Health Organization recommends that human donor milk be used as the second-best option to a mother’s own milk for a baby. I investigated how human donor milk is used as a public health intervention to treat and prevent health conditions in babies. I hope that I am able to express the importance and value in age-old practices such as breastfeeding that are undermined by aggressive formula advertising. In July, I traveled to Kenya to discuss the development of human milk banks in Nairobi with members of the Health Ministry. I also initiated my second project for the summer: researching the cultural factors that influence health in Kenya, specifically focusing on female genital cutting (FGC) and child marriage. Kenya is developing quickly, but like many nations, it struggles to disengage from injurious cultural practices. Our group met with organizations and facilities that empower and educate girls and community members to end gender-based violence. With a better understanding of the intersection between cultural practices and health in Kenya, we can more effectively create transformative initiatives. Dr. April Fogleman from the nutrition department at NC State introduced me to human donor milk banking. I was made aware of and joined the FGC and child marriage research project through my sister, Mansi Trivedi, a medical student at The Brody School of Medicine at East Carolina University, and Dr. Mary Nyangweso of the religious studies department at East Carolina University. What do you find most fascinating about your research? Realizing the interconnected nature between both my research projects has been fascinating. Through my investigations, I learned that malnutrition is a health outcome of child marriage. Investigating social practices such as child marriage and FGC has enabled me to see a deeper value in public health interventions such as human donor milk banks. Practices such as FGC push young girls into womanhood early, incentivizing families living in poverty to marry off their daughters at a young age, which can lead to early pregnancy. Young mothers experience pregnancies when they are psychologically and physiologically immature. This can cause health issues for the mother and baby. Malnutrition leads to low birth weight and prematurity, requiring a baby to have access to breast milk. Due to complications, young mothers may have trouble providing this milk. Human donor milk banks offer safe access to pasteurized donor milk. Who are the beneficiaries of your research? Almost every single woman worldwide can benefit from the research that is being conducted on human donor milk banks. Knowledge empowers women to make educated decisions about the welfare of their children. Lack of awareness internationally coupled with aggressive formula advertising reduces the utilization of milk banks impacting the health outcomes of babies worldwide. Increasing awareness can increase utilization and donation of milk worldwide, serving the needs of more mothers and babies. Women experience gender-based violence globally daily. In many cases, they accept the violence as a norm of life. Cultural ideologies that perpetuate gender-based violence must be deconstructed to empower young girls to realize their basic human rights. Through research and the identification of the long-term health outcomes of abuse, we can build stronger arguments against the cultural practices used to perpetuate violence against woman. Education at the grass-roots level and mobilizing government-led initiatives via public service announcements create this awareness. People are concerned that donated milk is unsafe. However, strict pasteurization protocol ensures milk safety. Due to low supply of donated milk, the most critical babies receive the pasteurized milk. However, with more awareness and education, increased milk donation can broaden the access to human donor milk to babies who are healthy and who do not have access to mother’s own milk. And gender-based violence is not just occurring in developing nations or certain areas of the world. In fact, gender-based violence, to varying degrees, is experienced in developed nations and it is not just limited to physical violence. Emotional and mental violence can be equally detrimental. In many cases, unfortunately, abuse that does not leave physical marks is not recognized. You were awarded the Chancellor’s Leadership Scholarship as a rising freshman. What opportunities has this scholarship afforded you, and what have you learned through the program? The Chancellor’s Leadership Scholarship allowed me to explore the world beyond the four walls of a classroom and to allocate my resources toward traveling and understanding the role I will assume as a working citizen. I have learned what leadership and service mean to me. I understand that service requires an exchange of time, knowledge, care and compassion. The true act of serving initiates a cycle of goodness because it is driven by humanity that is devoid of any expectations or savior complexes. I have found that true leadership requires a commitment to the enrichment of a group and not oneself. A leader empowers the strengths of a group by understanding the complexities of human experience. A leader does not stand above the team but is the foundation from which a group, community and larger society can work toward a common goal.